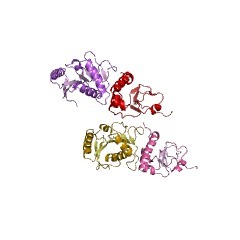 Polbase - Reference: Crystal structure of the chi:psi sub-assembly of the Escherichia coli DNA polymerase clamp-loader complex. The chi (chi) and psi (psi) subunits of Escherichia coli DNA polymerase III form a heterodimer that is associated with the ATP-dependent clamp-loader machinery. In E. coli, the chi:psi heterodimer serves as a bridge between the clamp-loader complex and the single-stranded DNA-binding protein. We determined the crystal structure of the chi:psi heterodimer at 2.1 A resolution. Although neither chi (147 residues) nor psi (137 residues) bind to nucleotides, the fold of each protein is similar to the folds of mononucleotide-(chi) or dinucleotide-(psi) binding proteins, without marked similarity to the structures of the clamp-loader subunits. Genes encoding chi and psi proteins are found to be readily identifiable in several bacterial genomes and sequence alignments showed that residues at the chi:psi interface are highly conserved in both proteins, suggesting that the heterodimeric interaction is of functional significance. The conservation of surface-exposed residues is restricted to the interfacial region and to just two other regions in the chi:psi complex. One of the conserved regions was found to be located on chi, distal to the psi interaction region, and we identified this as the binding site for a C-terminal segment of the single-stranded DNA-binding protein. The other region of sequence conservation is localized to an N-terminal segment of psi (26 residues) that is disordered in the crystal structure. We speculate that psi is linked to the clamp-loader complex by this flexible, but conserved, N-terminal segment, and that the chi:psi unit is linked to the single-stranded DNA-binding protein via the distal surface of chi. The base of the clamp-loader complex has an open C-shaped structure, and the shape of the chi:psi complex is suggestive of a loose docking within the crevice formed by the open faces of the delta and delta' subunits of the clamp-loader.